The AEMC has made a number of rule changes which come in to force on 1 December 2017. The changes relate to embedded networks and metering arrangements. Two major new roles will be introduced under the rule changes, an Embedded Network Manager (ENM) and a Metering Coordinator (MC). The regulator has made certain exemptions for caravan parks, holiday parks, residential land lease parks and manufactured home estates (caravan parks). Operators of caravan parks who operate an embedded network will often hold an R4 retail exemption and an NR4 network exemption, both of these exemptions apply specifically to caravan parks. Apart from the current conditions imposed under the exemptions, there are a number of state based Acts which impose restrictions on how much a caravan park owner or operator can charge residents for utilities. These restrictions must be complied with as well as the regulations and conditions under the Retail Law. Given these state based regulations, the regulator has decided not to impose the ENM conditions on caravan park operators except in particular circumstances. However, in order for a caravan park operator to avoid the requirement to appoint an ENM, they must have held a poll of their residents in relation to a resolution not to appoint an ENM. ‘We have omitted classes ND3 and NR4 from the relevant activity classes. These classes concern short–term rental accommodation (as is common in tourism) residential land lease and manufactured home sites. For class ND3, we do so on the basis that the transient nature of those tenancies makes it unlikely that there would be sufficient opportunity to offset the transaction costs of appointing an ENM. For class NR4, we are satisfied that the price control effect of State based legislation (where it exists) makes the costs of an immediate appointment of an ENM unlikely to outweigh the benefits of an early appointment’. Regulation 4.7.2 provides the provisions relevant to the non-appointment of an ENM and reversion. It applies to an embedded network serving eligible communities registered in activity classes ND2, NR2, NR3 and NR4. If a caravan park owner or operator does not want to appoint an ENM then they must follow the procedure set out in reg 4.7.2. This provides for a poll to be taken of the residents as to a resolution to not appoint an ENM. The procedures refer to eligible members for the purposes of voting. For activity class NR4 an eligible member will be ‘a person who principally resides there’. Prepare a resolution which states that the eligible community does not want to appoint an Embedded Network Manager. Prepare written information in support of the resolution. Remember that a copy of this information must be provided to the AER. 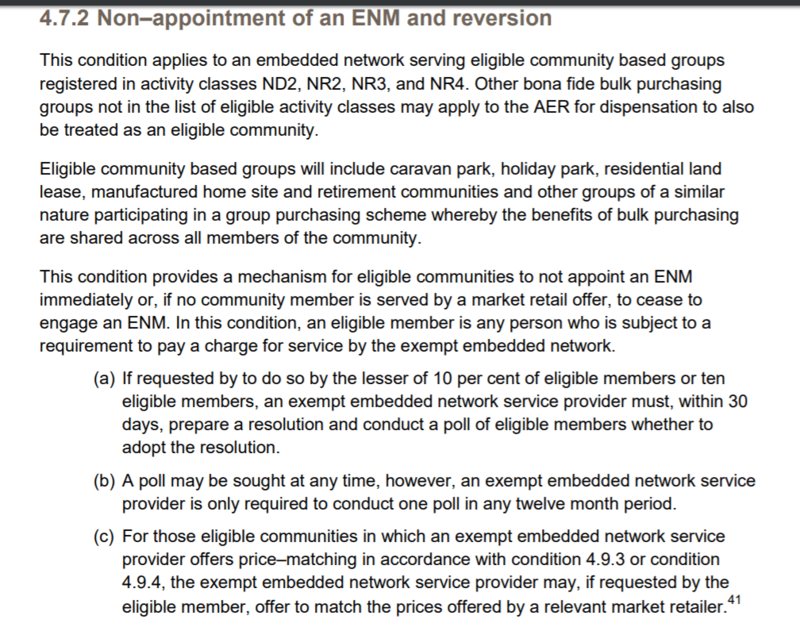 It may be useful to notify eligible members of the community that the REG makes provision for cost recovery of the provision of an ENM in an eligible community (4.7.1.1). Arguably this cost may be outside the definition of ‘supply of utilities’ contained in the state legislation. Remember that the reforms being introduced are about providing competition to consumers in relation to their energy bills. Due to the state based regulations, one may argue that residents of a caravan park are already receiving low or competitive rates for their utilities. Set a date for the poll which allows sufficient time for you to provide at least 14 calendar days notice to each eligible member of the meeting in writing. Prepare a written Reg 4.8.1 notice. Copy of the reg 4.8.1 notice. Hold the meeting and explain the process to the eligible members. Eligible members are not required to vote but if they do vote they may only vote once. Advise the meeting that you will be recording the votes and providing that information to the Australian Energy Regulator (AER). total number of informal voters and excluded voters. Make sure you take a careful record of this as it must be provided to the AER. In order for the resolution to pass you must obtain a vote in favour of the resolution by two-thirds of the eligible members. a copy of the reg 4.8.1 notice. AER will determine whether the caravan park operator may not appoint an ENM. The AER will provide a written notice of its decision to the caravan park operator. The decision does not take effect until receipt of the decision. 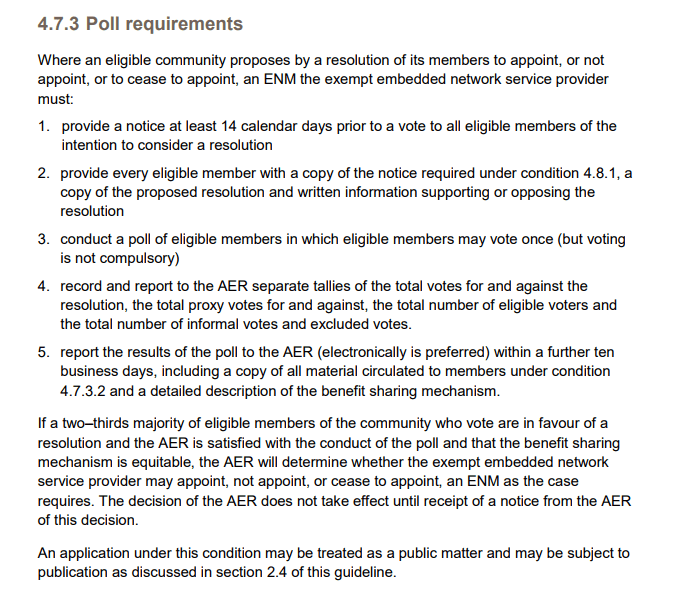 If you do not receive a vote in favour by a two thirds majority you may need to appoint an ENM. It would be worthwhile to prepare for the meeting carefully and perhaps engage with your residents prior to the meeting about the changes and costs involved. You are only required to hold one poll every 12 months but there is nothing to say that you cannot hold more than one poll a year. 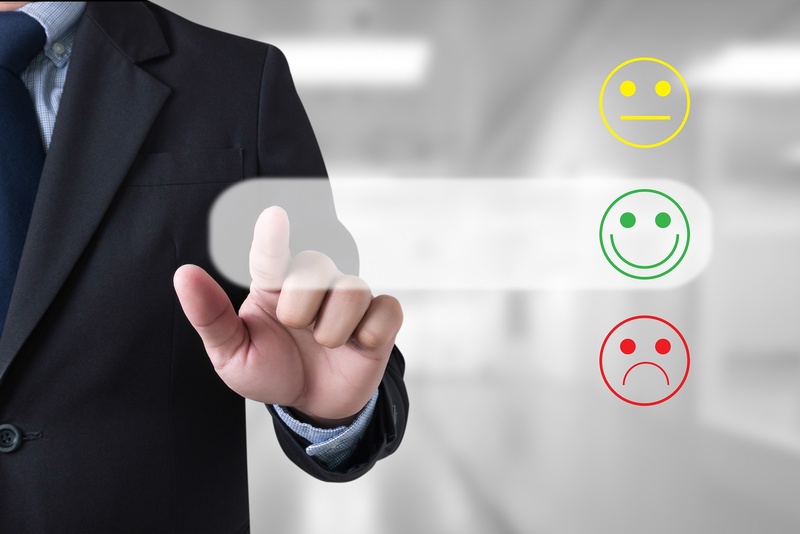 You will also be required to hold a poll if one of your residents is supplied by a retail seller or indicates they want to be supplied by a retail seller. It is therefore important for caravan park operators to be aware of the poll procedures. This is part of a series of articles I am writing which will look at the impact of the changes in Embedded Network regulations to caravan park operators. If you have any questions about this or require assistance with holding a poll or preparing documents for it please contact either Connor James or Anne Wardell at Compliance Quarter.